Once upon a time, there was a little lost princess named Victoria. When Princess Victoria was a baby, the good Queen Elizabeth sent her away to an orphanage, to protect her from her stepfather, the Wicked King. Years later, the Queen gave birth to another little princess named Carolyn. But the Wicked King was very wicked indeed, so the Queen bashed him on the head with a fire iron and buried him in the basement. At least, that’s how she remembers it. Danny (thinks): The thing about Six Twenty Two is that it’s like a solar eclipse. You can’t look at it directly; it’s too brilliant and beautiful and damaging. Also, it doesn’t really exist. Eve: I want you to help me prove beyond all doubt that Jeff is really Peter Bradford! Nicholas: And how do you expect me to do that? Eve: The powers you have, they give you a certain amount of control over time and space. Danny (thinks): Really, the biggest mistake you can make is to treat Six Twenty Two as if it were real. It is clearly not a real episode of a network television show. Princess Victoria stayed in the orphanage for many years. And when she grew up, the Queen sent for her, and invited her to live in the palace. But even though the Wicked King was gone, the Queen didn’t tell the princess the secret of her royal lineage, because this is a daily television series, and we have a hell of a lot of half-hours to fill up. And then Eve just sits on the couch, and reads The Saturday Evening Post. As Victoria traveled to the Queen’s palace, she met a handsome, dark prince named Burke Devlin. He was a cross between Mr. Rochester from Jane Eyre and Mr. Darcy from Pride and Prejudice, and he was played by an alcoholic character actor who couldn’t remember his lines. Danny (thinks): The “experience” that you have watching Six Twenty Two is really a mental construct that you create on the fly. It’s a natural defense mechanism that helps you deal with the existential meta-crisis of actually watching this lunatic mess of a show. One day, the handsome Prince Burke showed up at the studio, and he sat in the wastebasket, so drunk that he couldn’t go on. So the producers gave all of the prince’s lines to Joe, and hoped that nobody would notice. And nobody ever did. Angelique: I can do for you what Nicholas refused to do. Eve: I don’t believe you. You don’t have that kind of power. Angelique: I can send you back to the past, for a brief period of time — long enough for you to do what you want to do. Danny (thinks): It’s like a near-death experience. There isn’t really a bright light that guides you towards heaven. That’s just your brain desperately trying to make sense of the limited sensory input it’s getting, as vital systems in your body start to shut down. You think that you’re seeing two noisy women in gowns, standing outside somebody else’s house, arguing about reincarnation and time travel at the top of their lungs. You think that this is something that was written and filmed by grown-ups, and then broadcast on ABC television at four o’clock in the afternoon. But it isn’t real. And so the recast Prince Burke won the heart of the little lost princess. They made ever so many plans, and they decided that when they were married, they would live in the palace with the Queen and her family. The lost princess still didn’t know that she was actually the Queen’s daughter, but by this point she was marrying a prince anyway, and she was going to be a princess one way or another. So who even cares? Angelique: But the proof exists — in the year 1795. And I can send you there. When you return, you’ll be able to be with Jeff again! But Prince Burke was killed in a super unlikely plane crash in Brazil, and the lost princess never found her happily ever after. Danny (thinks): My point is that history is getting over-written, again and again. Somewhere in there is the “real” story — Barnabas and Josette and Angelique, loving and betraying and outsmarting each other, with poor Phyllis Wick caught in the crossfire. But then Vicki stumbles into the middle of things — Phyllis Wick’s underprepared understudy, pushed on stage by a mad, dead ten-year-old — and Vicki instantly starts telling people things that they shouldn’t know. She spends every waking moment deliberately trying to create paradoxes. It would be so easy! Danny (thinks): After a while, there are so many inconsistencies and muddled mysteries that Vicki’s crumpled-up character arc becomes a monster — a huge, unfulfilled, all-consuming loose end. And then she falls downstairs through time, crushing every butterfly she sees along the way. That’s why Vicki has two of everything; her entire storyline is just one Schrodinger’s cat after another. She’s living two parallel lives, and the only way to resolve it is to look inside the mystery box that nobody wants to open. Elizabeth Collins Stoddard or Betty Hanscomb? Mitchell Ryan or Anthony George? Victoria Winters or Phyllis Wick? Peter Bradford or Jeff Clark? Did Burke Devlin fall, or was he pushed? Ron Sproat: The first law of thermodynamics is that storyline material can be neither created or destroyed. Sam Hall: The second law of thermodynamics is that of course you can create new story ideas, Ron, we’re doing it all the time. That’s our job. Danny (thinks): I keep trying to explain to Vicki that there are consequences to time travel. In fact, you usually get the consequences first; that’s the whole idea. Then the lost princess had a time-travel adventure in the distant past, and when she finally returned to the Queen’s palace, nobody ever mentioned Prince Burke again. She just started talking about this new prince — Peter, or Jeff, or whoever — and everybody went along with it, even though in story time Burke was only dead for about two weeks at that point. And that’s because something is seriously wrong with time, and I’m pretty sure that Vicki broke it. Vicki is an idiot. Danny (thinks): I do know, by the way, that my bonkers half-kidding-but-not-really “Vicki destroys time” conspiracy theory is completely impenetrable, even if you’re obsessive enough to know who Betty Hanscomb is. 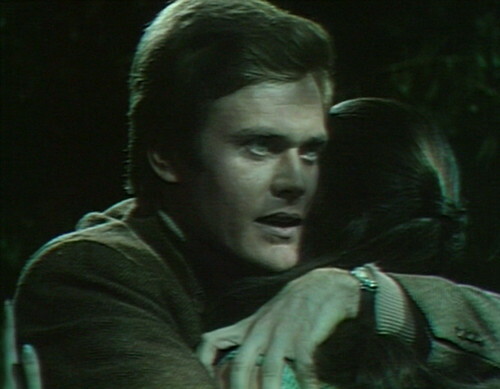 But this is something that I actually sincerely love about Dark Shadows. All of the inconsistencies and retcons and recasts and bloopers invite active audience participation, to fill in the gaps. Yeah, I have my own personal head-canon that I’m making up as I go along. Everybody does. Dark Shadows is complicated, and mysterious, and rich in detail and backstage lore — just like Lost, and Doctor Who. Just like life, actually. Danny (thinks): In tomorrow’s episode, we’re going to see that Joshua copied the “official” version of the Collins family history out of the book that Vicki brought with her from 1967. This is absolutely unpossible. Flash-forward to a year and a half from now, in March 1970: We’re going to hear about a whole new tragic ending to Vicki and Peter’s story, which creates its own weird ripples and eddies through history. 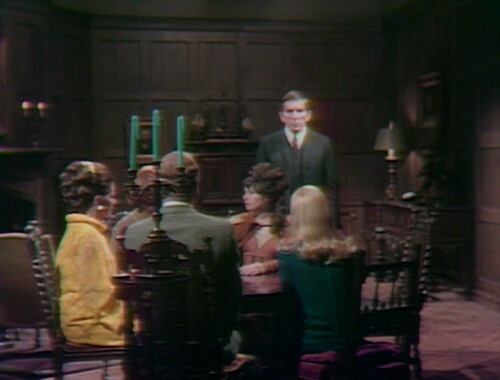 And in the very next episode, Barnabas Collins walks into the abandoned east wing of Collinwood, and has his first glimpse of Parallel Time. As far as I’m concerned, that means Vicki’s reckless time travel has created all of these tangled timelines. Parallel Time is Vicki’s fault. Everything is. There are 1,245 steps to complete the ritual. One of the steps is missing. The ritual has only been completed once. Danny (thinks): So whatever happened to Victoria Winters? We know what happens to Alexandra Moltke — she has a baby, and turns into Betsy Durkin. But did Vicki really run away with Peter, or did the Leviathans kill her? Why did Barnabas remember Phyllis Wick? Did Vicki’s time travel create a chronographic instability that fractured the space-time continuum? Was she really Liz’s daughter? Who was actually hanged that night? Seriously, does anybody actually know what happened to Victoria Winters? I thought this used to be a television show about her. What happens to an unfinished story, when you get distracted and start talking about something else? 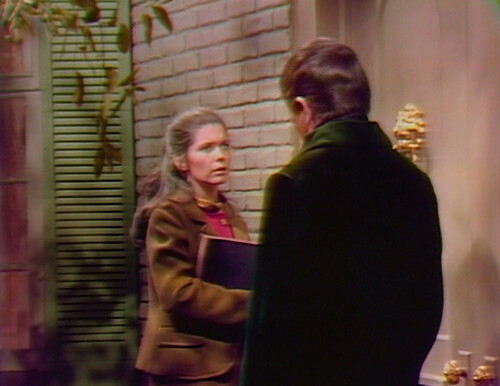 Nicholas tells Eve (and an eavesdropping Angelique) that Julia and Willie sent Barnabas to a hospital a few miles away. But there’s no way for him to know this — I’m sure Julia didn’t send him any telegrams with updates on Barnabas’ condition. He couldn’t even listen in on Julia and Willie’s conversations, because he doesn’t have the magic mirror anymore. When Angelique approaches Eve on the terrace, the boom mic drops into the shot at top left. This was the episode where Grabby Davis got so overly excited in his scene with Marie Wallace on the terrace that he grabbed her by the arms and threw her completely out of frame. You see her struggling to remain on her feet as she stumbles off to the right. Some 20 years later at a fan convention (it’s in Dark Shadows 25th Anniversary Special from the disc set that has the last episode of the series), Marie Wallace brought this up as Roger Davis was telling the audience of how they (or rather he) would cut up and laugh and have fun while they were making the episode, and of how they would just laugh off their flubs. Wallace then broke in to remind Davis of episode 622 as she recalled, “Hey, Roger? I didn’t laugh when you threw me out of frame in that scene, on camera. Remember that? Several times?” She explained to the audience how all during dress rehearsal he’d never touch her and then when he’d done it on camera he’d come up to her and apologize profusely, but Wallace told him then and there at the convention that she never believed him. I always like a good time is fractured explanation. I think the only way to explain the super accurate in the details “Titanic” is that Jack and Rose are both really time travelers who knock everything just slightly out of whack from events to moral and social norm concepts. So magical things happen, like fitted dresses made to wear with a corset still fit and appear fitted without one, the lookout being distracted from the burg at exactly the wrong minute by Rose and Jack running around like idiots, things we know happened happen to completely different people at exactly the wrong time, etc. Also on the reboot of the “Star Trek” franchise. If they aren’t heading for a time is going to explode because we didn’t restore the timeline and save Vulcan why in the name of God does everybody know all about strange things (like tribbles) the original crew discovered years later in a little known area of space. I think Danny’s theory of Victoria destroying time is perfectly sound except that someone sent her back there in the first place. 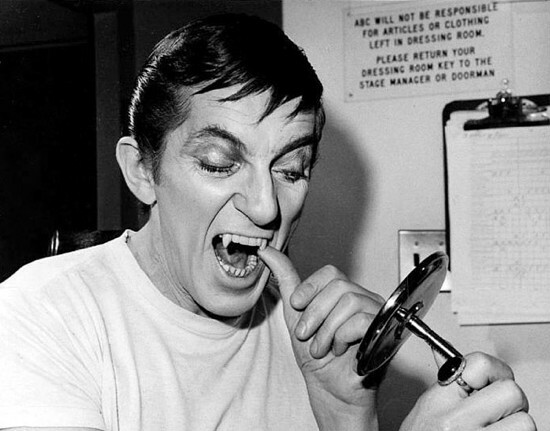 I doubt it was seriously Barnabas, his plans never work and if it was, what was his goal? If THAT had been part of Nicholas’s grand plan instead of Adam and Eve think of the story possibilities in that. Or it could have been Angelique. Let’s have that story instead. When I started watching the VHS set’s in the 90’s, I started keeping notes on what was going on, with all the time travel and crazy retcons. I’m pretty sure I like Star Trek better then DS, but I never did that for Star Trek. But like you wrote, it’s part of the interactive charm of Dark Shadows. Before Eve travels back to 1795, Barnabas remembers Phyllis Wick. After Eve’s return he remembers Vicky Winter’s being in 1795. That’s where it changes from “real” time to our first parallel time stream. That’s why nobody remembers Burke. Oh! I didn’t realize that Barnabas remembers Vicki at that point. There, my conspiracy theory turns out to be correct. Final answer. Yeah, about a month from now I believe, Barnabas goes back to 1795 to save Vicky. But, before he does that he spends an episode telling Julia about his final days in 1795 before the coffin, and his memory is of Vicky being sent to the Gallows. I blame Sarah for the timey-wimey. Wasn’t she responsible for sending Victoria Winters on a strange and terrifying journey back to the year 1795 to discover how it all began? Well yes, Sarah did send her back. I don’t think it occurred to her that Vicki would be such a complete idiot about it though. I mean, the most obvious thing to do is try to make sure that you don’t step on the wrong butterfly and mess up history. Instead, Vicki spends a lot of her time actively trying to change things without even considering that if, for example, Josette doesn’t take a header off of Widow’s Hill then she won’t be around to save Vicki from Matthew Morgan 350 years later. That’s what I was thinking. I think Sarah’s ghost had power. I don’t know if she directly sent Vicky back in time, but I think she was a factor. There were always unseen forces at work. Nothing but work, for the unseen forces. God, I love this show. Do you know what I mean? I’m just glad it didn’t get lost in time, space and dimension, like we thought it had, for the longest time, after it ended in April of 1971. All these years later and here it is. We are lucky. 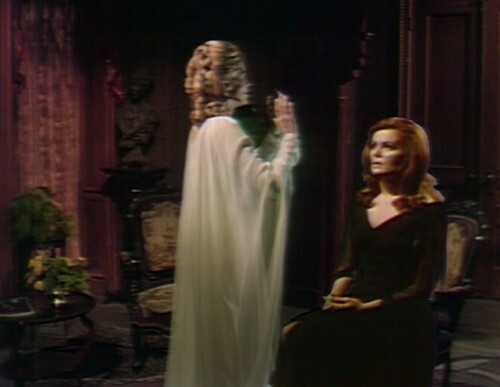 It’s never explicitly stated, but the implication is that Sarah sent Vicki back (and it did happen during a seance contacting Sarah) – presumably so she’d learn that Barnabas was a vampire. Seems like a convoluted way of doing things but what do I know. Yes, but it was Barnabas whose suppressed conscience and humanity summoned her back, as Julia explained to him at one point, Sarah representing “the part of yourself that’s lost”. But then, it was Willie who let him out of the box, and Willie was there to let him out because he was a sidekick of Jason, and Jason returned because of the deal he’d made with Liz all those years ago, and Liz did what she did because of what Paul Stoddard was about to do. So I blame Paul Stoddard for kicking off the whole chain of events, and for–at least according to the story bible of Art Wallace–being responsible for Vicki being born to begin with. Is there any way we could pin this on Malcolm Marmorstein? I never liked that guy. I love this analogy – for conveniece sake I would love to accept the notion that Vicki is the byproduct of Liz and/or Paul – however if you went solely by character behavior and mannerisms this wouldn’t seem to be the case – Liz is a somewhat selfish woman who really didn’t seem to enamoured with Vicki – she was kind to her like any aristocrat would be to a well respected member of the household staff – on the other hand the universe revolved around her daughter Carolyn. Liz also treated her ex (and Carolyn’s father) Paul Stoddard with the love/hate feelings that would have probably been the result of a passionate relationship early in their marriage. Vicki is simply ‘too nice and naive’ to have been the child of either of these people. Thats why I believe that her parents could only have been Betty Hanscomb (who was probably the product of an affair between Jamison Collins and Betty’s housekeeper mother, accounting for Vicki having connections to the Collins bloodline) and hapless former Collins Cannery manager Bill Malloy, who himself wasn’t the brightest flame in the candelabra but a heck of a nice guy, ala Joe Haskell. Yes, definitely the daughter of Betty Hanscombe. The portrait of Betty Hanscombe that they used on the show was based on a publicity photo of Alexandra Moltke, so they were certainly implying that Vicki was Betty’s daughter. 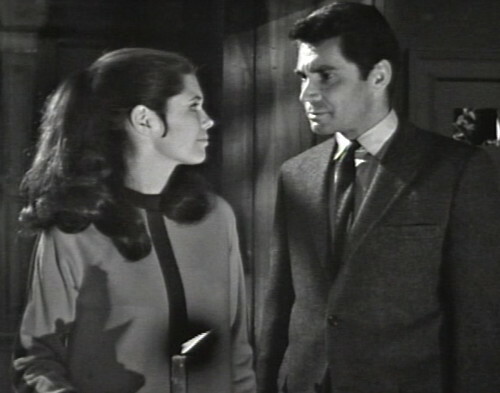 In later years there was an attempt to bring the closure to that part of Vicki’s story that the show never got around to doing, with Joan Bennett confirming that she (Liz Stoddard) was Vicki’s mother in a home video from the 1980s and Moltke at a 2001 cast gathering answering an audience question in the affirmative, and then in 2003 the audio drama Return To Collinwood (written by Jamison Selby as a Dan Curtis Production) having Liz admit it in her will. The original show itself was about to go in that direction, but Moltke had to leave abruptly. 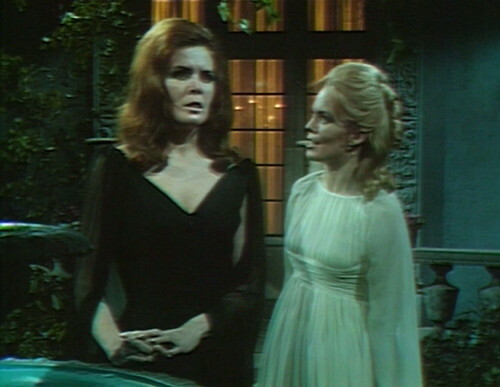 One thing that strains the believability of this relationship between Liz and Vicki is the distance of formality that Liz maintains: Vicki is at Collinwood for two and a half years, and all the while, though she accepts Vicki as one of the family, she does nothing to change the fact that Vicki addresses her as Mrs. Stoddard, as would any servant like Mrs. Johnson for instance. Everybody, we’re missing the obvious! Vicki IS Betty Hanscombe!!!!! Somehow she managed to time travel AGAIN and ended up in Collinsport circa the 1940s and adopted the Betty Hanscombe identity, working her way as a servant at Collinwood. She had an affair with Paul Stoddard, gave birth to herself (at which point the adult Vicki ceased to exist) and THAT’S what caused all the irreperable harm to the time stream/parallel time/anything else you want to blame on Vicki. Oh my god, that is my new favorite theory. I think you nailed it. In 1966 DS this would not be a good storyline but for 1968 DS it’s brilliant! Well done Pedro. to Nicholas, knowing he’s already in a bad mood. She likes to walk with danger. My absolute favorite part of this post is that it cites footnotes in the future. We aren’t commenting on the DS Universe anymore; we’re living it. It is as if we have all cast the I Ching wands and passed through the door to the Infinite. In the words of Prof. Stokes: “Beyond the Door, anything is possible!” Episode 700 can’t come soon enough. He came to town to be a supernatural player for Satan Industries. Now, he’s got two overgrown, underdeveloped adopted adult brats, and he’s on 24 hour psychic diaper-duty. And if Adam and Eve are his middle-schoolers, Angelique is his college drop-out daughter, who’s been expelled for smoking Tanna leaves on campus and for “fangs”, something all the kids have been doing this semester, apparently. They’re all completely incorrigible ingrates. Nicholas needs another splash of Seagram’s. My theory re Vicky’s parentage is Betty Hanscombe and a Collins we have never heard of, perhaps a brother to Liz and Roger never ever spoken of for some reason. Definitely not Paul Stoddard. I also think David was Burke Devlin’s son. Hey, what if it turned out that her parents were named Frank and Rhoda Winters? What a buzzkill that would be. My own theory: Victoria the daughter of Jamison Collins and Betty Hanscomb. So she’s Roger and Liz’s half-sister. Liz knows and Roger doesn’t. 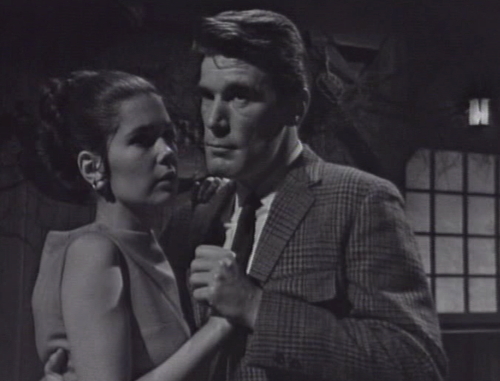 Jamison aggressively seduces Betty, on whom Roger had teenage crush. He makes her pregnant and then coldly casts her out. A pregnant Betty shows up at Collinwood and tells Liz and Roger about what happened. Roger confronts his father in a fit of rage in the Tower Room during one of Collinwood’s famous storms. Jamison Collins has a heart attack during the confrontation, and Roger leaves him in the room to die. Roger staggers out, and Liz finds her father dead. 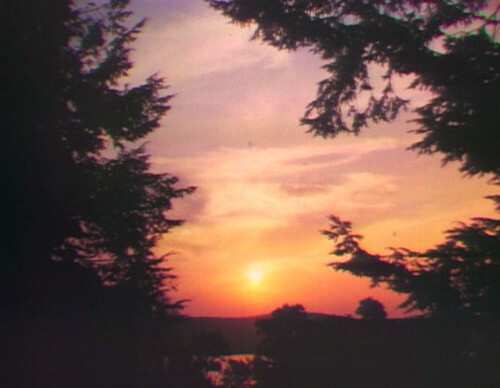 Roger has a complete breakdown and is sent to Windcliff, where Dr. Julius Hoffman, uncle of Julia Hoffman, wipes out his memory of that night in the summer of 1946. (And this is why Liz is so fond of Victoria, but not like she is with Carolyn. And this is why she refuses to tell Roger anything about why she brought Victoria back). She’s the daughter of Victoria Lord, who traveled from Llanview to Collinsport to give birth to one of many children she didn’t know she had. I had a blast watching Marie Wallace and Lara Parker work together. Angelique finally has a suitable female sparring partner. I think Eve is the first woman Angelique has ever respected. The problem with Victoria stepping on the wrong butterfly is that once she is plopped down in 1795, anything she does effects a butterfly, and thus the future. So, even if Vicki said to herself “I mustn’t do anything to change these people’s lives”, even talking to them for a minute longer than Wick did one afternoon in the drawing room could change oceans of future events. Therefore, Vicki might as well try to right wrongs, ala “Groundhog Day”. And if both Nicholas and Angelique can send anyone back into the past, changing outcomes could become a game, we could play this every day. The most serious ramification, of course, is that something you do ends up preventing your own birth. Ergo, Vicki, who just might be a Collins, was playing with real fire back in 1795. The other option is that Vicki imagined the whole 1795 story. But then what about Eve’s trip back?